Artificial Intelligence (AI) is the ability of machines to work and act like humans. Popular examples include voice assistants Alexa and Siri, smart thermostat company Nest, and the self-driving capabilities of Tesla. In this article, we will review companies that make use of AI technology to provide pet products and services. First up is Petcube, makers of a popular pet camera. 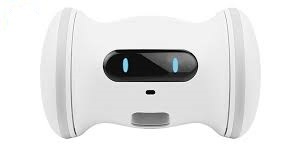 The latest version of the camera contains AI technology that can recognize pets (and humans) and detect whether your dog is barking or your cat is meowing. 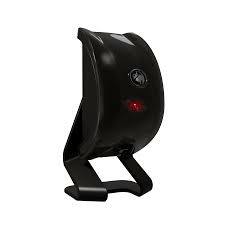 The camera can then send an alert to your smartphone, so you can then view the live video feed and see what your pet is up to. This opens up some interesting possibilities. Because the device can also dispense treats and allow for 2-way conversations, we can envision a clever dog learning how to get a treat even when home alone. Our smart pup sits in front of the Petcube and barks, which triggers an alert to its owner at work. Owner then accepts the video call from their dog, tells him he’s a good boy and then pushes a button to deliver a treat. Petcube also plans to roll out a pet behavior diagnostic feature, that will assist owners in caring for their pet’s health and wellness. Presumably, this means the device will be able to tell if a pet is sick based upon what it views through the camera. Felik is a laser pointer pet toy that uses AI to play with your dog or cat. The technology uses a camera and algorithms to track and react to a pet’s movements autonomously. Felik does not require human interaction and does not follow a pre-programmed pattern. 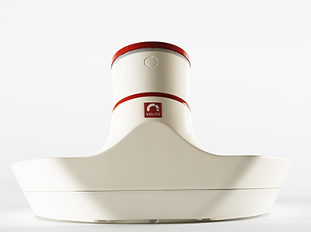 The software determines the room size, attempts to plot an optimal course for the laser, and then constantly moves around based upon the reaction of your pet. The AI algorithm also prevents the laser from shining directly on your pet or any nearby humans. 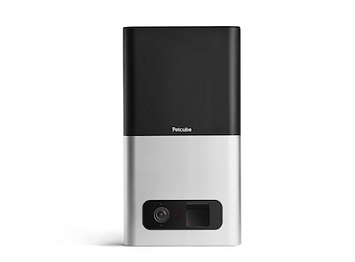 Felik allows you to activate the laser and watch all the action from your smart phone. Mookkie, which bills itself as the AI powered pet bowl, debuted this year at the CES show. Mookie uses Volta AI, a visual recognition framework, to make sure a pet’s meal is not consumed by another pet. A camera built in to the food bowl scans the face of an approaching animal and, if a match, opens a flap over the bowl permitting access to the delicious kibble within. The authentication system is similar to the face-unlock feature on newer smart phones. Personally, as the pet parent of two golden retrievers and an orange tabby cat, I can see a real value in this product. Because our goldens constantly steal the cat’s food, we have been forced to permanently move the cat’s bowl up onto a table in the living room. I wanted to purchase a Mookkie to see if it would stop our food thieves, but Mookkie will not begin shipping the product until September of 2019. VARRAM is a fitness robot for pets that uses AI to keep your pet active and health. 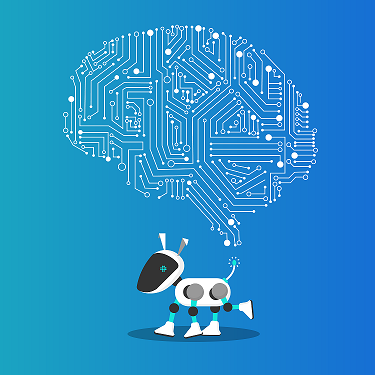 While still in the development phase, VARRAM bills itself as a “five stimulus artificial intelligence robot.” VARRAM can move itself around a room, with its sensors recognizing walls, furniture and pets. Thus, it will be able to play with your pet without getting stuck under the couch. The VARRAM is currently being crowdfunded on Kickstarter, with plans to beign shipping in 2019. 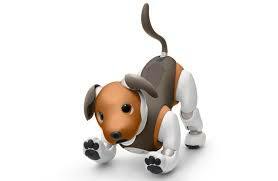 Finally, we have Aibo, the robot dog from Sony. Technically, Aibo is not a pet product as it was not designed for use with dogs or cats. Rather, Aibo is a full on robot, that looks and acts like a dog. The AI engine in Aibo was designed so that the more you interact with it, through talking and petting, the more the robot recognizes your face and listens to you. Sony claims it intended Aibo to be able to connect with its owners on an emotional level and enrich their lives. A little bit creepy perhaps, but I suppose this could be beneficial for lonely and isolated people.